You'll hear it in news coverage of the Church scandals"Clerical Culture"but what does it mean? 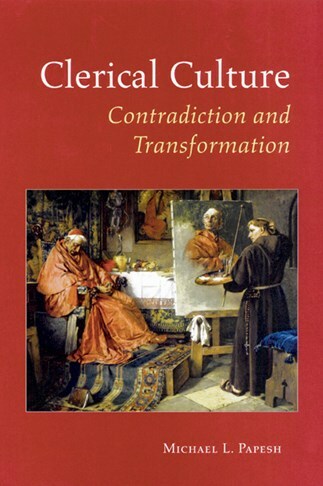 In Clerical Culture: Contradiction and Transformation Michael L. Papesh provides an understanding for todays clerical system and present circumstances. Papesh describes the origin and contemporary formation of the clerical culture as well as eleven major contradictions in which todays clerical culture is trapped. To transcend these crises, Papesh calls for a spiritual approach to cultural transformation (both clerical and popular) through leadership: in holiness, in love, and in justice. Written in an engaging style and complete with raw data and appendices, Clerical Culture provides the knowledge needed to understand todays Church crisis. Chapters in Part One, Focusing the Issues are: A Personal Story, The Problem, How the Clerical Culture Came to Be, The Clerical Culture: Set for the Ages, and Theological Underpinnings. Chapters in Part Two, The Contradictions are: Priestly Formation, Priest Accountability, A Priests Personal Support System, and Living a Contradictory Life. Chapters in Part Three, Considerations Toward Transformation are: Cultural Transformation, Being Leaders in Holiness, Being Leaders in Love, Being Leaders in Justice, and The Spirit and the Bride Say Come. Also includes Appendix 1: Cleveland Priests Hopes and Concerns Based on Three Areas of Challenge, Appendix 2: Cleveland Priests Large-Group Discussion Task Force Charges, Appendix 3: Summary: The Basic Plan for Ongoing Formation of Priests, Appendix 4: The Organizational Life Cycle: Change Grid, and a Bibliography. Michael L. Papesh is Pastor of Our Lady of Peace Parish in St. Paul, Minnesota. This book is a convincing, informed and courageous facing of facts. . . . The author and, one hopes for the good of the whole church, readers clerical and lay will agree that cultural transformation is possible and that we, all of us, need to begin the process. Usually such books as Clerical Culture are boring and repetitive, but Michael Papesh is offering us something very readable, intelligent, and genuinely interesting. He is critical in the good sense, and faith-filled in the best sense. We desperately need such a book as this in our soul searching time. Michael Papesh's book should be read by every priest in the Church to better understand the clerical culture they live in as well as themselves. It shows that transformation is possible. All Catholics will get a better appreciation of the priesthood today and why it is what it is. It is a thoughtful book which doesn't just point out problems but shows that there are alternatives to many of the time-concretized notions of priesthood. Michael Papesh's analysis of clerical culture and its demons is both insightful and balanced. This important and timely book lays bare the ecclesial context which spawned the priesthood's present dark night. Moreover, Clerical Culture: Contradiction and Transformation sheds considerable light on the shadowy dynamics and structures of the clerical world. As someone who ministers to priests in the midst of the sexual abuse crises, I wish everyone of my brother priests could meet Fr. Michael Papesh. In the midst of this critical time in the presbyterate, Fr. Papesh appears as an icon,' if you will, leading us into the darkness and pain while exposing us to healing and light from the other side. Listening to (or reading) Fr. Michael Papesh one quickly recognizes that his authority comes from the multiple facets of this crisis that he represents and presents; he shines with the sincere love of a Christian, he hurts with the passion of a victim, he reflects the intelligence of a theologian, he counsels with the compassion of a pastor, and he speaks with the eloquence of a preacher. This is an honest work! From the heart of a pastor, Michael Papesh presents us not only with a sense of our history, and the state of the problem, but he outlines a plan for our future. Clerical Culture: Contradiction and Transformation can take us from despair to hope, from reclusion to renewal. This work can lead us to a new day!
. . . a significant piece of reflexive research for those interested in the clerical state and the contemporary church. Papesh's arguments are anchored in a vision of the gospel and ministry that aspires to a high ideal and standard. His book is well worth reading for anyone who finds the status quo revealed by the abuse scandal bewildering and angering, and who desires something better for the Church. The book offers the community a very readable, comprehensive, honest and balanced look at the clerical culture. It is not a rant; it is a challenge to face what is unhealthy, unholy, and ineffective in our church in order to find new possibilities and renewed life. Michael Papesh has offered us many insights into the dominant clerical culture of our time and has suggested ways for transforming it into a priesthood of service and community leadership.